Poached the Haddock in water and retained the water. Charred and braised Leek halves. Made a light Onion, Leek and Potato Soup with the Haddock cooking liquer and a little milk. When cooked removed the turned Potato garnish and some of the cooked Potato to make a Pommes Puree. Blended the remainder of the Soup. Finished with a little cream and corrected seasoning. 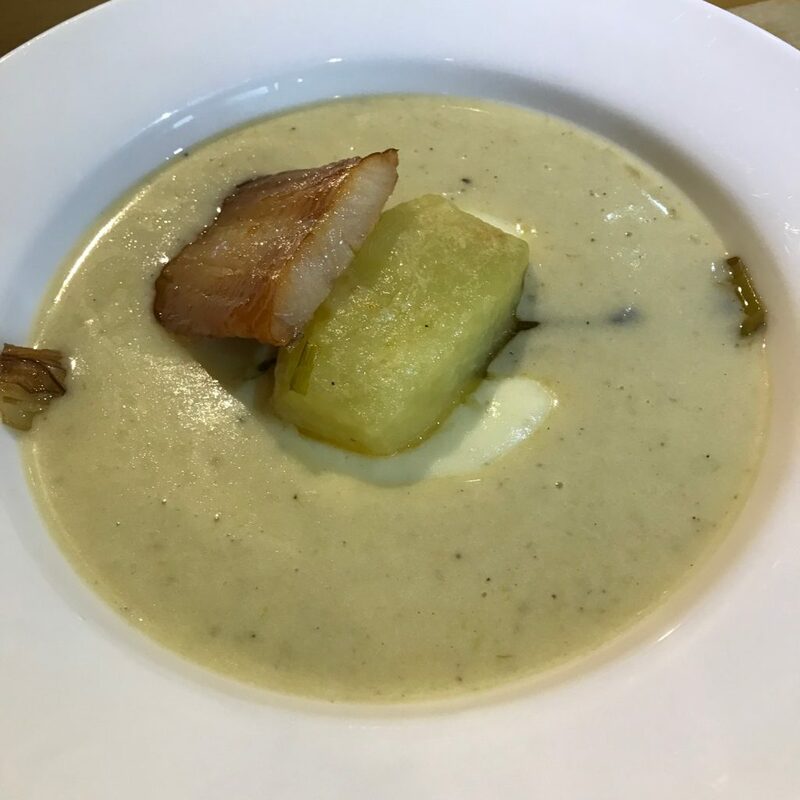 Served the Pommes Puree in the bottom of the bowl topped with the charred Leek and then the grilled turned Potato. Added the soup and finished with the hot Haddock. 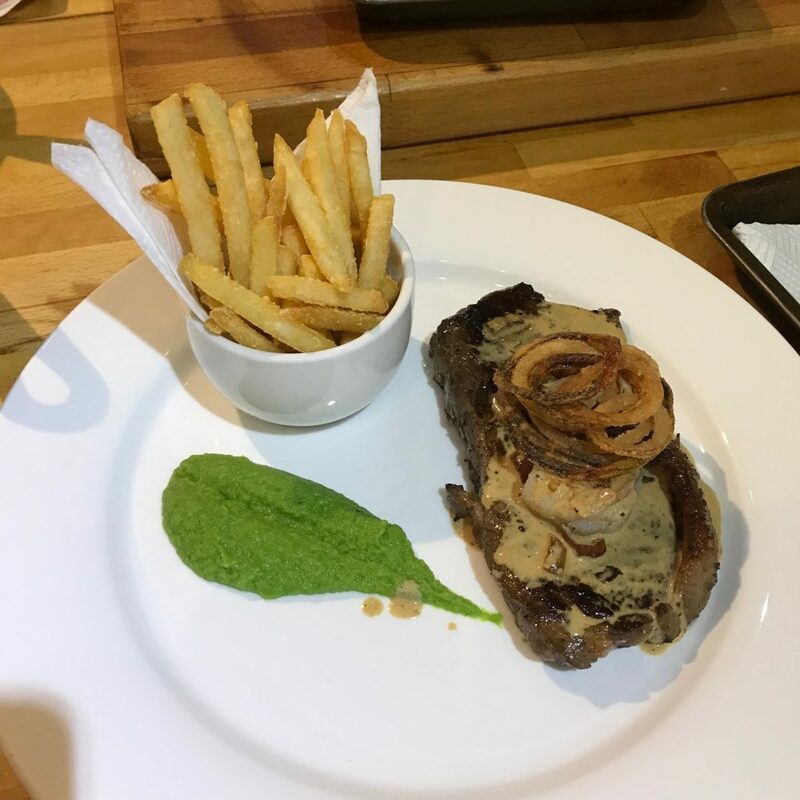 Pan-fried Sirloin with seasoned Pommes Frites and Pea Puree. Finished with King Prawns, Whisky Cream Sauce and crispy Onion rings. Took a Brioche and trimmed and sliced it. Buttered each side and pressed nibbed Chocolate into the bread. Returned to a slightly fanned Brioche shape and then put in a large ramekin. Added sweet Vanilla Egg custard and left to absorb. Cooked in a bain marie in tin foil. Removed from the oven, brushed with Butter and sprinkled with Demerara Sugar and returned to the oven Served with lots and lots of Custard.